The Middle Fork of the Salmon River is an unspoiled, remote and pristine wilderness much as it was 100 years ago or more. 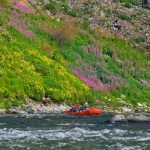 Named by National Geographic as one of the top 3 river trips in the world, the Middle Fork Salmon River will provide you with a continuing medical education seminar of a lifetime. 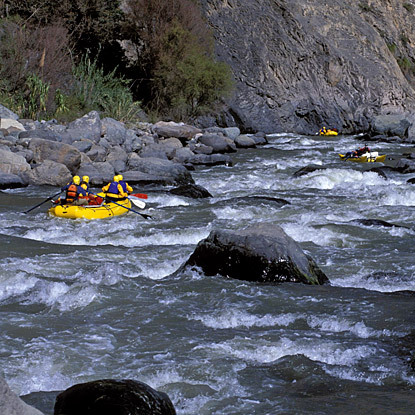 The Middle Fork of the Salmon River is the premier wilderness rafting trip in the US. It’s gin clear water flows 100 miles of Wild and Scenic free-flowing river, through the largest road-less wilderness area in the US and in a canyon that is deeper than the Grand Canyon. It has half a dozen natural hot springs throughout the canyon, blue ribbon trout fishing, and more than 100+ rapids grade I-III+. The Middle Fork of the Salmon is an unspoiled, remote and pristine wilderness much as it was 100 years ago or more. 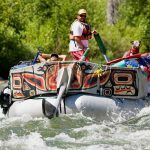 Named by National Geographic as one of the top 3 river trips in the world, the Middle Fork will provide you with a vacation of a lifetime as well as the perfect back drop for CME medical training. This is one of the few trips on the Middle Fork where you get a fantastic, scenic flight to the put-in at Indian Creek. With this fall itinerary, you have more time to enjoy the multiple hot springs and hiking trails, the opportunity to man your own inflatable kayak and fly fish in what many consider the best season to fish on the Salmon! Middle Fork River Expeditions, our local guide company, has been in business for over 60 years and that is no coincidence. MFRE was chosen as one of the top 3 river outfitters in the world by National Geographic Adventure magazine in 2008 and 2009. They focus on guests’ experience to not just see the river from a distance, but to experience it intimately with the leadership of experienced guides. Their mission is to allow river travellers the opportunity to unplug from modern society and recon-nect to oneself, family, and friends through nature’s lens. This adventure allows you to have a digital detox from technology and reconnect to a more simple, fulfilling pace of life. There is no Wi- Fi in the wilderness, but we promise you will find a much deeper connection. Our equipment is specially designed for wilderness whitewater rafting, and offers mild and wild boat choices (oar boats, paddle boats, inflatable kayaks and stand up paddle boards). Our river guides are seasoned professionals, licensed by the state of Idaho and First Aid and Swiftwater Rescue Certified. They are expert river runners, magnificent cooks, great storytellers, and knowledgeable, helpful outdoorsmen and friends. Please arrive in Stanley, Idaho the night before the trip begin on Sept 8. Stanley is a 45-minute flight or 3-hour drive from Boise or a 1-hour drive from Sun Valley. We have a pre-trip orientation at the MFRE Warehouse at 7:30pm on Sept 8th. The MFRE warehouse is located next door to the Triangle C Ranch on Highway 21 in Stanley. We will get acquainted; answers questions, and have a one-hour orientation to show you how to pack the waterproof gear bags we provide for your personal gear. For rooms we recommend the Triangle C Ranch (208-774-2266) that has clean cabins good for families for the evening before your trip and on Sept 14th. We also have 10 rooms reserved under “Middle Fork River Expeditions” at the Mountain Village Lodge (800) 843-5475. Another good choice is the Sawtooth Hotel (208-721-2459). We meet this morning at 8am at the MFRE warehouse and depart by 5 and 9 seater airplanes 23 minutes to Indian Creek Air Strip. The flight is an additional ~$130/person (we will take credit card info or checks made out to Sawtooth Flying Service at orientation) and the lower put-in point makes it a 75-mile river trip. Guests always say the flight into the river is one of the highlights of the trip. This flight also allows more time for hiking and exploring the canyon, as we will be doing 12 miles a day versus 17 miles a day on average. Upon launching our rafts at Indian Creek, 4700 feet above sea level, you’ll enter Pungo Canyon which has some fun whitewater before soaking in the Sun Flower Hot Springs, which is a natural shower! After hiking up to Loon Creek Hot Springs, we run Grouse Creek and Tappan Falls rapids. Stops at pioneer homesteads provide the perfect balance to the on-river excitement. Evenings find us eating gourmet river meals relaxing by the campfire, playing horseshoes and listening to the river and watching for shooting stars! The Middle Fork is a catch and release Blue Ribbon Cutthroat Trout fishery with anglers catching as much as 100+ fish/day. Because we are high up in the drainage, fish usually max out at around 16 inches. MFRE provides instruction with 2 company fly rods and numerous flies for those who would like to learn the art of fly-fishing. September is the ideal time for fishing on the Middle Fork. As we drop in elevation, the river widens and the spruce forest opens to vistas of pine-studded mountains and we enter Impassible Canyon, where no trails can be cut as the sheer walls go up over 3,000 feet. This section of river is deeper than Grand Canyon. We will navigate fun whitewater such as Haystack, Bernard, Earthquake Rock, Jack Creek, Cutthroat Cove, Redside and Weber rapids. Between rapids, you’ll drift quietly over deep pools of transparent water, home to native cutthroat and rainbow trout. Short hikes underneath Waterfall Creek and up to Veil Falls are highlights for many of our guests. There are many longer optional hiking opportunities throughout the river corridor and all have stunning vistas of the canyon. Some hikes are out and back and others are loop hikes. There is also always optional hiking from camp as the Middle Fork Trail runs along 80 miles of the Middle Fork. There are hundreds of hiking options so too many to list. If you are into a more active hiking trip just let the Trip Leader know and we’ll make it happen for you. 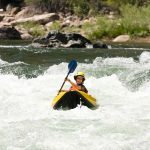 The last day has some of the best and biggest rapids of the trip, including Rubber and Cramer Creek Rapids, which is a great whitewater crescendo finale for the week. We arrive at the take-out point at Cache Bar around 10am and drive by bus 1 hour for a picnic lunch at the North Fork Country Store. After lunch, we drive 3 hours to Stanley, arriving between 4-6pm. You can leave your car parked at the MFRE warehouse in Stanley during the trip. After a hot shower at your hotel, enjoy Stanley for a nice dinner on your own at the Sawtooth Hotel or the Casino Club or drive 10 minutes to Red Fish Lake Lodge. The next morning drive home or to Boise for flights after 12:30pm. $2,500 per person, based on double occupancy; plus $130 for scenic flight to Indian Creek put-in. ♦ ground transportation by bus from Stanley to the river and back to Stanley after the trip. ♦ meals from lunch Sept 9 to lunch Sept 14. ♦ expert leadership with seasoned professional river guides who are Wilderness First Aid and Swiftwa-ter Rescue certified. ♦ all camping equipment including 4-man tents for 1 or 2 people, large rectangular 20F sleeping bag, 2” sleeping pad, splash gear tops and bottoms, farmer john wetsuits, and waterproof socks and neo-prene gloves (if needed in June/early July). ♦ 3 dry bags: one for camp clothing, one for sleeping kit (pillow & sleeping bag) and one small dry bag for items to have access to during the day like sunscreen, rain gear, camera etc. ♦ all commissary equipment for meals and camp. 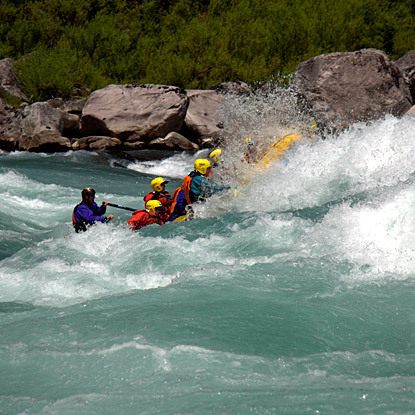 ♦ all rafting equipment (life jackets, helmets, paddles etc.). ♦ all water craft including oar boats, paddle raft, inflatable kayaks and inflatable stand up paddle board. ♦ MFRE mug to use and take home after trip. Flights to/from Stanley, Idaho; Motel in Stanley for night before the trip and night the trip ends; flight into Indian Creek ($130/person); travel insurance (we strongly recommend); optional tipping to guides (10-15%+ of trip cost) depending on level of satisfaction; additional alcoholic beverage beyond those outlined below. Deposit: $600.00 per person, required for confirmed reservation. There is commercial air service to Boise, Idaho. Then you have 3 options to get to Stanley. Drive: Rental cars – Budget, Payless, Alamo, Hertz, Avis. Cost around $300/week. Shuttle: Caldwell Transportation- 800-727-9925- departs at 4pm from Boise airport and 7am from Stan-ley. Reservation must be made 48 hours in advance. Cost is $85/one way or $165 roundtrip. Fly: Sawtooth Flying Services- 800-798-6105 or 208-342-7888. ~$335 Boise/Stanley per person round-trip. Please call in advance to reserve these flights. Sun Valley Option: Another option is flying into Sun Valley (Hailey Airport) and take a taxi (~$150/van one-way) to Stanley, which is ~1 ½ hours north. It costs more to fly to Hailey than Boise but more con-venient. Wood River Taxi in Hailey- 208-788-TAXI. Plan to arrive in Stanley, Idaho by early evening the day before your trip for our 7:30pm meeting at the MFRE warehouse, located ¼ mile west on hwy 21 from the Mountain Village Resort on the left hand side of the street, between the Triangle C Ranch and the Meadow Creek Spa. There are three MFRE wooden oars at the driveway entrance. We will get acquainted and answers questions, and have a 1-hour orientation to show you how to pack the 3 waterproof bags we provide for your per-sonal gear. Please have dinner before the meeting. The next morning we depart at 8am. You can leave your car parked at the MFRE warehouse during the trip. Valuables are best left in the trunk of your car. Middle Fork River Expeditions attracts gifted guides for whom leading trips is their passion. Middle Fork River Expeditions guides positively elevate your experience by being educators, companions, and the best of friends. Most MFRE guides have 10 or more years experience as guides, all are First Aid and Swiftwater Rescue Certified, and are licensed by the Idaho Outfitters and Guides Licensing Board. Middle Fork rapids are rated 1 to 3 on a scale of 1 to 6. 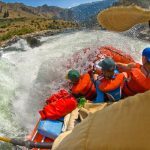 In our state-of-the-art whitewater rafts, you’ll run 100+ rapids with the aid of experienced, professional, licensed guides. River Requirements: Mini-mum age is 6 in July to September. Please note, all participants must be able to swim and be in good physical shape. There is plenty of time and numerous opportunities to hike and visit hot springs during your trip. All hikes during the day can be done in your river shoes and not hiking boots. 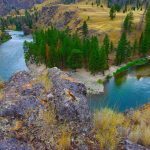 The Middle Fork Trail runs 80 miles along the Middle Fork, so there is always the option to hike or run along the trail from most campsites and hiking boots can be used from camp for these hikes. There are half a dozen hot springs in the river corridor and we camp at or near at least one during our trip. Time and logistics permitting we hike to waterfalls, scenic grottos, native Shoshone Sheepeater pictographs, or historic hermit cab-ins in a given day. MFRE provides instruction with 2 company fly rods and numerous flies for those who would like to learn the art of fly-fishing. The Middle Fork is a fisherman’s paradise; a blue ribbon fishery and all fish are natives – Cutthroat Trout, Rainbows and Dolly Varden. Special fishing regulations protect the Mid-dle Fork and help restore the fish population – (catch-and-release, no live bait, single barbless hooks.) An Idaho State fishing license is required and may be purchased in Stanley, Idaho before the trip at the Mountain Village Mercantile. The best fishing shop in Stanley is McCoy’s (208-774-3377) and you can purchase licenses, flies and all your fishing needs in one professional shop. Kids 14 and under can fish with no license. To get your license in advance, go to https://id.outdoorcentral.us/. You do not need a license for Day 6 as we will have an early morning and many rapids so not ideal for fishing, so just get the license for Days 1-5. We will send you a recommended fly fishing tackle list a couple of weeks be-fore the trip or you can request one anytime. This is one of the best parts of the trip, to be lullabied to sleep by the sound of the river. We provide all camping gear for you, including a large rectangular sleeping bag, 2” Paco Sleeping pad, small camp pillow and 4-man tents (for 1 or 2 people only). Guests are expected to set up their own tent but guides are always available to help single travellers’ or guests that need help. In the evening, we have chairs to relax in for meals and around the campfire. We bring along a wilderness porta-potty and place it in a private place with stunning views. 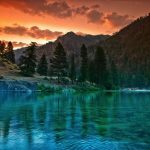 We practice Leave No Trace camping ethics, so you are sure to learn a lot about this on the trip and be able to take some of these new skills home with you. The Middle Fork is a very pristine river and there is no bathing allowed in the river and all bathing must be done above the high water mark, at least 100 feet from any water source and with biodegradable soap. We have collapsible buckets that you can fill with hot spring water after soaking and can lather up away from the hot spring and have a friend gently pour it on your head. There are some great swimming holes and rock jumps on the river that are always optional. No diving is allowed and life jackets must be worn at all times when swimming. As this is a free flowing snowmelt river drainage, the water temperature is too cold in June (40-50F) for swimming, refreshing in July (60-70F), and com-fortable in August (70+F). We provide healthy and delicious meals, accompanied with lots of salads, fresh fruits and vegetables. We also use as much organic produce/products as is available in central Idaho. Our goal is to have you eat healthy meals so that you feel good and refreshed during the day with lots of energy for fun in this remote wilderness setting. Vegetarians, Gluten Free and Paleo diets welcome and meat eaters alike. There are also always snacks available during the day. Our past guests rave about our menu and dutch oven delights! We offer drinking water at all times as each raft has a water cooler as well as electrolyte crystals during lunch. For evening we provide soda such as Coke, Diet Coke, Izze and San Pellegrino. We provide lim-ited (1-2 glasses/person) red and white wine in the evenings. We do not provide beer and you are free to bring some, just make sure beer is in cans only. For those who want more than a couple of glasses of wine at night, you can bring more wine if you wish and glass is ok. Hard liquor can be brought in glass as well. Idaho weather can be variable and vigorous. So, come prepared with warm and cold weather clothing. There is no such thing as bad weather if you bring the right clothing. Synthetics are best for layering and keeping you warm in all weather conditions. Weather during the daytime is 70-90F and evenings 40-60F. The easiest way to think of river trip clothing is having both daytime “river” clothes which are synthetic and dry camp clothes which are cotton and more comfortable. The daytime clothes will be wet and your camp clothes will be dry. Have a back up set for both and you will be very well prepared. Below is our recommended clothing and equipment list. If you bring what’s on the list you will be all set for the trip. If it rains at camp we set up large tarps so everyone stays dry and have a roaring fire to keep warm if it’s chilly. During the day, the oar rafts have large umbrellas that can be used in addition to your splash gear. · Pillow (this is a camp pillow- 10” x 12”, so if you want a full sized pillow please bring it). ** Sept/Oct trips- bring a ski hat, camp gloves, 1 pair of synthetic long john top and bottoms, and fleece type pants. 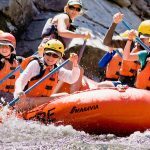 High adventure activities in the heart of Patagonia, Chile on the Futaleufu River include: whitewater rafting Class II-V, hiking, horseback riding, fly-fishing, daily yoga classes and mountain biking! Relax during your stay at our deluxe riverside camp with hot tub, sunset bar, massage, wine tasting, and more! Our Cotahuasi Rafting Expeditions features 6 days of some of the most continuous, classic, technical, fun whitewater, in the deepest canyon on the planet. Combined with amazing Arequipa, a beautiful hike on an ancient Inca footpath, and Inca ruins and artifacts, this is an adventure like no other! 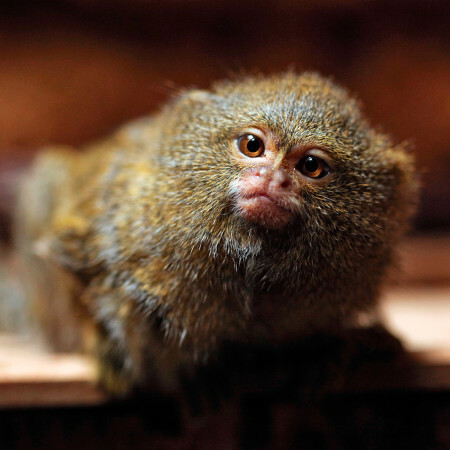 This International Veterinary Seminar takes you through lush tropical rainforests to secluded wilderness beaches and remote luxurious jungle lodges. Immerse yourself in the pristine, unspoiled parts of Costa Rica. 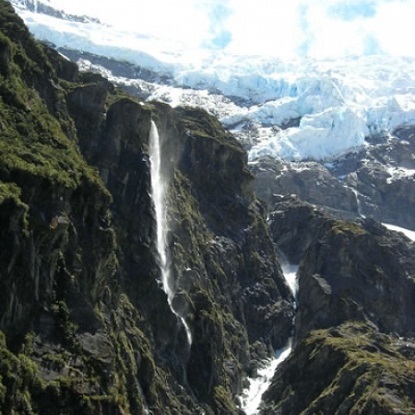 Trek through National Parks, sea kayak in the Tonga Island Marine Reserve, white water raft the Buller River, explore numerous glaciers while all along, marveling at the diversity New Zealand has to offer!